Everything was always so good, is what I’m saying, until it suddenly wasn’t. That aside, Imagine Us Happy is a fantastic portrayal of a scenario that so many people find themselves in, in relationships of all types. The unusual thing about emotional and mental abuse is that so many of us have no idea how to recognize it’s happening to us. We’re shown from a young age what physical and sexual abuse look like (though those lines can be hard for victims to recognize until they’ve already been crossed, too! ), but many of us have no idea how to differentiate between an “argument” or “joke” and abuse, until we’re in the thick of it (if ever). Kevin’s got this look on his face that I can barely stand to look at. Anger makes Kevin look like an entirely different person. I spend all of my time lost in his words, or his eyes, or his touch, and every time I’m pulled back into reality, I want less and less to do with it. The most realistic thing about Stella and Kevin’s relationship isn’t even just the abuse, but what comes in the gaps between the toxic moments, too. We see things that might seem justifiable to some, like Kevin’s constant obsession over whether Stella is cheating on him or not, or the way Kevin and Stella get so wrapped up in one another that Stella literally forgets important events in her best friends’ lives, because Kevin’s gravity has pulled her in so tightly and won’t let go. This is so common in toxic relationships. What’s also common is the way Kevin convinces Stella that he’s genuinely sorry, or the decency he shows her in between fights (like his strongly valuing her consent in certain scenes). Kevin is a perfect example of what many abusers look like, because he’s not a villain 24/7—he has enough good moments that he convinces Stella to put up with the terrible ones. Sometimes I just get… sad. Another thing I loved here is the mental illness representation. On one hand, we see how Kevin’s mental illness can make it difficult for him to react properly to certain situations—but on the other hand, Stella’s own mental illness struggles give us a clear balance that avoids vilifying or romanticizing mental illness in any way. I guess that’s why I’m starting at the end. I don’t want anyone to be confused about the type of love story I’m about to tell, or where it’s going, or what to expect. And I don’t want to disappoint anyone in search of a happy ending. I’ll say it from the start: this isn’t that kind of story. Finally, there’s the storytelling style. 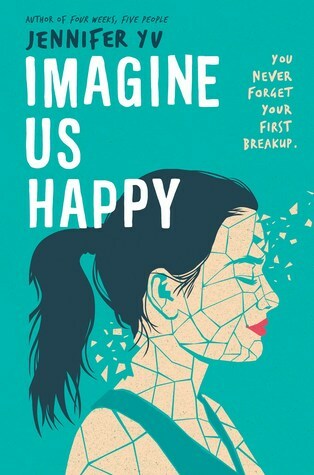 Imagine Us Happy is told in a nonlinear fashion, starting at the end before jumping back to the beginning, and occasionally giving us glimpses of the build-up to the ending (so, if you’re reading it and wondering why the chapter numbers don’t go in perfect order, it’s not a misprint). It is such a unique and cool formatting idea, and I felt like it really got the message across so much more clearly than a standard beginning-to-end reading style. I know that the tenderness is as temporary as the flash of anger that preceded it, but I can’t help but let myself soak in it, cling on to it like a drowning man to a rope. I feel like there’s more I could say, but honestly, just read it. This is a fantastic book and I highly recommend it. I genuinely hope to see this book promoted heavily, especially in school libraries, because I think the sometimes brutal honesty depicted here could help so many readers. I don’t know if I could handle the sadness, but I like the idea of the unique structure! It is sad! It’s good, but if you’re not sure you’d be up for the tough topic, I don’t blame you for passing on it at all. ♥ And sorry for the late reply, ALL of your recent comments to me got caught in my spam filter for some reason! WTF WordPress? I have no clue! I’ve never marked one of your comments as spam and you didn’t even add a link, so it’s really weird! 😦 It did it to this reply, too. At least it will teach me to check my spam filter more often, and hopefully it fixes itself soon! Well ty ty ty for checking your spam box. I’m sorry for the inconvenience! I feel like I’ve been waiting for this book to be written! So excited for release! Ahhh I’m so excited for the release of this one!! Thank you so much, love!! ❤ It was so good and I just hope everyone loves it as much as I did! Adding this to my TBR for.. someday when I’ll know I’ll be able to handle it, hah. Take your time, but I hope you enjoy it if/when you read it! This review was perfect. I love that the book portrays emotional and mental abuse because, as you pointed out, it’s not commonly talked about, whereas other types of abuse are. As someone who has been emotionally abused for a lot of my life and starting to become comfortable talking about it, I’m both excited and apprehensive to read a book that I’m probably going to be able to relate to. It’s easier to dive into a book with such serious content after reading a review about it because at least now I know what I’m going to get myself into. I’m excited about the mental illness rep, too! I’m always hesitant to read books about mental illness because they’re either really great at raising awareness and portraying it accurately or they contribute towards the stigma – and usually it’s the latter! I’m putting this on my TBR straight away! Thank you so much, Kelly, you’re so sweet. ❤ I'm so sorry to hear that you've gone through that abuse, but I am so proud of you for reaching the point where you're prepared to talk about it and heal. I've been there too, too many times, and I have to say that parts of this story definitely poked a sore spot, so take care of yourself, but it was really cathartic and I hope it helps you heal. I am ALWAYS here if you need anything at all, and even if there are things I can't fully relate to, I will always listen and be a shoulder to cry on if you need one. ♥ I love you! I’ve been wanting to read this so badly! I definitely thought it was just depression-focused from the description, so the heads-up is much appreciated. I’m definitely still going to read it, but am glad I know now what to expect. Yeah, I didn’t hear many people talk about that aspect of it before it came out! I felt like I had to say something since I honestly feel like the depression is such a less prominent facet to the story than the toxic relationship is. It’s such a good book, though! I hope you enjoy it!